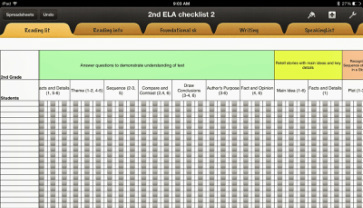 A great idea is to use Numbers for the iPad or computer to download the checklists that are published in Canvas. These checklists can easily be changed to suit your individual students and your needs. An Ed Tech, Janae Hunt, has changed each of the spreadsheets to have check boxes for mastery reporting. As you can see, a teacher can just tap on any square to show mastery for that skill. She has also locked the headers and student names so it is easy to navigate the spreadsheet and recording student data. The tabs along to the top allow you to go from one standard to the other. It's simple to add more rows and columns, too. Download these modified checklists below and use them on your computer or iPad with the Numbers program!